Sorcerers borrow their power from demons; every sorcerer hosts a demon. Penric, for example, shares his head with the demon Desdemona. While sorcerers are as mortal as any human, demons are very hard to kill. When sorcerers die, their demon jumps into the nearest host: human if a human is nearby, but some other animal if they are not. Only if a host is not within range does the demon die. Magal was bowshot. An arrow can travel farther than a demon can hop. The killer chose an isolated location for the kill, a place far from potential human hosts. Whoever killed Learned Magal appears to have been trying to kill the demon as well as the human. If the demon was the (or at least a) target, the killer was not careful enough. A small tuft of fur on an arrow left at the scene (and the fact the archer seems to have left in a great hurry and neglected to collect the arrow) is evidence that the killer overlooked a fox until after Learned Magal was slain. Penric and his demon Desdemona have two tasks. The first is straightforward enough: catch Learned Magal’s killer. That is as easy as making a list of all the people who might have wanted Learned Magal or her demon dead, then eliminating all of the people who didn’t kill her. Easy peasy. The second is far more challenging: find and catch a specific fox out of the several hundred that live in the woods where the body was found. Sigh. I have to go back and re-do the numbering for several Penric reviews. (This novella is the fifth published, but the third in chronological order, as you no doubt recall.) I understand that this sort of thing doesn’t bother most people, especially the authors who suddenly jam an extra story into their continuity, but knowing that my sequencing is incorrect or misleading is vexing. Fingernail on blackboard vexing. Oh well. Onward. As camping trips involving Bujold protagonists go, this one was pretty sedate. Only one person was killed and they weren’t actually travelling with Bujold’s protagonist. Compared to Cordelia’s, Miles’, and Fawn’s (of the Sharing Knife series) country travels, it’s nigh on violence free. Reading this Penric novella I was reminded of Jo Clayton’s Diadem books. Both Penric and Aleytys found themselves hosting dead folks’ experiences, thanks to an unexpected encounter. One such hosting is due to magic (Penric); the other is thanks to technology indistinguishable from magic. Still, same same. The difference is the settings: Penric lives in a world with stable institutions adept at managing the possessed, while poor Aleytys lives in a chaotic galaxy and has to fend for herself. Still, I wonder if Bujold has one or two of the Diadem books on her shelves? This particular Penric is a procedural. It’s a second cousin to series like Cadfael. The trick to murder mysteries in fantasy worlds is to set the magic up in such a way that it doesn’t render solving the mystery trivial . In this book, the rules of magic in the Five Gods books do not lend themselves to casting Solve Mystery spells. In fact, even some mundane methods are off the table: circumstances prevent the investigators from being able to question the one living witness to the murder. Penric’s Fox isn’t a particularly flashy addition to the series. Given that the it had to be written so that it could be inserted into an existing sequence without raising continuity issues, it couldn’t be rife with dramatic, continuity-changing events. It is, however, a perfectly functional country mystery, a benign addition to Penric’s history. 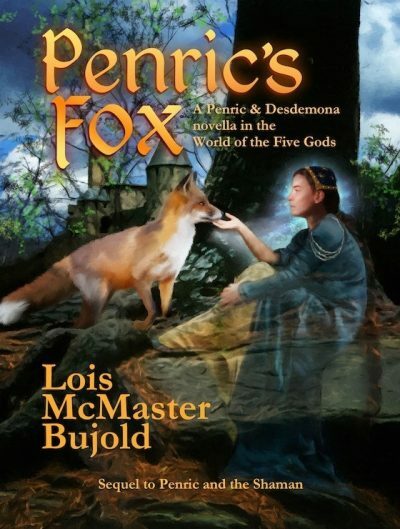 Penric’s Fox is available here (Amazon). It is not available from Chapters-Indigo (although the audiobook is.). 1: Which is similar to the reasons given for why science fiction mysteries were thought to be impossible. If the detective can just, I don’t know, look for any of the killer’s DNA at the scene, how does the writer avoid having every case end with the cops pulling out their gene-o-matic scanners as soon as they arrive? Or if everyone carried an advanced communication device with embedded camera, how could murderers avoid having their victims record the crime as it unfolded?